Deploy a hybrid cloud with all-ﬂash performance on optimized infrastructure based on Azure Stack. 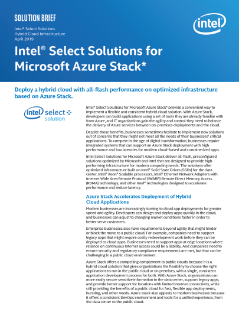 Intel® Select Solutions for Microsoft Azure Stack* provide a convenient way to implement a ﬂexible and consistent hybrid cloud solution. With Azure Stack, developers can build applications using a set of tools they are already familiar with from Azure, and IT organizations gain the agility and control... they need to balance the delivery of Azure services between on-premises deployments and the cloud. Despite those benefits, businesses sometimes hesitate to implement new solutions out of concerns that they might not meet all the needs of their businesses' critical applications. To compete in the age of digital transformation, businesses require integrated systems that can support an Azure Stack deployment with high performance and low latencies for modern cloud-based and containerized apps. Intel® Select Solutions for Microsoft Azure Stack* deliver all-ﬂash, preconfigured solutions optimized by Microsoft and Intel that are designed to provide high performing infrastructure for modern computing needs. The solutions oﬀer optimized infrastructure built on Intel® Solid State Drives (Intel® SSDs) for the data center, Intel® Xeon® Scalable processors, Intel® Ethernet Network Adapters with Internet Wide Area Remote Direct Memory Access (RDMA) Protocol (iWARP) technology, and other Intel® technologies designed to accelerate performance and reduce latency.